It seemed to resonate at the time too: “Sleep by no means comes too soon / In a valley lit by the moon” he sings on the album’s opening track ‘Kare Kare’. Perhaps in some way because of the influence of the changing elements and the dramatic landscape, the recording of Crowded House’s fourth album ended up also being confronting, emotional and difficult, an intense period that changed the course of the band’s history. Says Finn, “A lot of relationships fell victim to that period, and I don’t know what to put that down to entirely. As much as there were great psychic goings on and comings together of different worlds, there was also some odd energy. The story of Together Alone began in the aftermath of extensive touring of the band’s 1991 album Woodface, oft-cited as Crowded House’s best, what with featuring radio-friendly singles ‘Weather With You’, ‘Four Seasons In One Day’, ‘Fall At Your Feet’ and ‘It’s Only Natural’, though in choosing Together Alone as his favourite Crowded House album, Finn now refers to Woodface as “overlong and a bit piecemeal”. The band had toured Woodface in New Zealand too, a visit that rekindled Melbourne-based Finn’s love for his homeland. That renewed kinship coincided with a wish to make an album that was “looser, sprawling and a bit more psychedelic”. Horrocks’ house was identified as the spot for this “exotic and extravagant plan”, with one crucial ingredient now top of the list of priorities: the appropriate producer to join Finn, bassist Nick Seymour, drummer Paul Hester and new band member, multi-instrumentalist Mark Hart. The success of Woodface allowed the band their choice of some of the world’s foremost record makers of the time, such as Steve Lillywhite (Morrissey, The Psychedelic Furs, U2) and Gil Norton (Pixies, The Triffids, James). But given the kind of album Finn wanted to make, and the potentially unsettling nature of the setting, the selection was something out of leftfield: Youth, former bass player in Killing Joke making his name as an eccentric producer, in the early Nineties most well known for work in the realm of dub and with electronic/ambient pioneers The Orb. “He wasn’t like any of the other producers we met at the time,” says Finn. “My inclination and ours as a band was to go for a less predictable choice than someone like Lillywhite, who’d made a lot of great records. We went round to visit Youth in Brixton [London], and he had just had such an unusual set-up. He came across like an escapee from Glastonbury, but within that there was keen intelligence and I think Paul was pretty impressed with how much pot he smoked. “He’d sit back and wouldn’t say a lot in terms of specifics, he’d just encourage us to keep playing and listen out for good jammy moments and encourage us to be as loose as we could. Today, Together Alone stands as Finn’s most emotive, moving work, and it is the combination of the Kare Kare environment and their freewheeling producer that is responsible for that, along with such telling ingredients as Mark Hart’s deeply sensitive contributions on 12-string guitar and pedal steel, and the Maori flavours that ripple through the record. But it was the elements – the tide, the mist and the valley – that affected the album the most. A mystical allure threads through Together Alone, perhaps the result of a subconscious response to the landscape by those involved, yet the impact of the conditions was also very literal and direct. “We were suddenly aware of the landscape every day, and the light and the way things were changing. If it was a rainy day it just didn’t seem appropriate to be doing a certain type of song. I remember specifically recording ‘Fingers Of Love’ in the manner that we did, which was very different to how we rehearsed it, on a grim, dark ominous-looking day and I’m sure that had a lot to do with it. Together Alone is the most otherworldly of Crowded House albums, though Finn’s style of balancing the personal and private against the cosmic stretches back to the band’s eponymous debut LP in 1986 and even the Split Enz days. But those Catholic flavours were distorted and developed by both the location, and the particular values that Youth brought to proceedings. Such a singular experience recording the album left Crowded House a markedly different band in Together Alone‘s wake. In the years leading up to the residency at Kare Kare, they were cast a certain way by fans and media thanks to their jauntier singles and high-spirited live shows. But the rawness and intensity of the period, Finn believes, allowed something altogether more brooding to emerge, and even sewed the seeds of the band’s split in 1996. In particular, the effect the time had on the much-loved Hester, whose longstanding depression led him to commit suicide in 2005. “In the course of allowing other versions of our band to exist, it opened up some slightly darker aspects, which might not have ended up being very good, I don’t know. “We were pretty much cast as the ‘fun’ and ‘joking around’ band with Paul being the way he was, we had made a reputation on being these fun-loving guys from down under, a little bit cartoony, and the album definitely let a darker streak emerge. Hester left the band during an American tour in 1994, with Finn pulling the plug completely in 1996. The reformation in 2007 with Seymour, Hart and new drummer Matt Sherrod was at least partly designed to “leave some good history in there, instead of that big deathly full stop”. For a man famously averse to picking favourites among his songs and albums, that Finn identifies Together Alone as his preferred Crowded House album is some statement. And it remains beloved among fans too, containing as it does some of the band’s most ambitious, complex and atmospheric singles, such as ‘Private Universe’, ‘Fingers Of Love’, ‘Nails In My Feet’ and ‘Distant Sun’. Some of the album tracks contain some of Finn’s most extraordinary moments, such as the coda on ‘Catherine Wheels’ and startling lines such as “Will we be in our minds when the dawn breaks? / Can we look the milkman in the eye?” on ‘Walking On The Spot’. 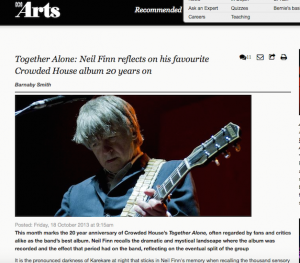 Together Alone can be thought of as the beginning of the most creatively fertile and imaginative period in Neil Finn’s life to date. Two years later came the much looser first Finn Brothers album with Tim, then in 1998 his first solo album Try Whistling This was even more experimental with elaborate electronic touches courtesy of another influential producer, Marius De Vries. Indeed, every turn he has made since 1993, particularly those unexpected ones, such as Pajama Club or the Seven Worlds Collide project, can be traced back to that cathartic and perspective-shifting time at Kare Kare, where the senses and nature met music.